Eight products, including pork, will now be subject to additional tariffs of 25%, it said, with the measures effective from April 2. “China’s suspension of its tariff concessions is a legitimate action adopted under WTO rules to safeguard China’s interests,” the Chinese finance ministry said. China has slapped extra tariffs of up to 25% on 128 U.S. products including frozen pork, as well as on wine and certain fruits and nuts, in response to U.S. duties on imports of aluminum and steel, China’s finance ministry said. The tariffs, to take effect on Monday, were released late on Sunday and matches a list of potential tariffs on up to US$3 billion in U.S. goods published by China on March 23. China’s Ministry of Commerce (MOFCOM) said it was suspending its obligations to the World Trade Organization (WTO) to reduce tariffs on 120 U.S. goods, including fruit. The tariffs on those products will be raised by an extra 15%. Eight other products, including pork, will now be subject to additional tariffs of 25%, it said, with the measures effective from April 2. China has imposed the additional tariffs amid escalating trade tensions between Beijing and Washington, sparking fears of a full-blown trade spat between the world’s two biggest economies. U.S. President Donald Trump is preparing to impose tariffs of more than US$50 billion on Chinese goods intended to punish Beijing over U.S. accusations that China systematically misappropriated USA intellectual property - allegations Beijing denies. China has repeatedly promised to open its economy further, but many foreign companies continue to complain of unfair treatment. China warned the United States on Thursday not to open a Pandora’s Box and spark a flurry of protectionist practices across the globe. In a statement published on Monday morning, MOFCOM said the United States had “seriously violated” the principles of non-discrimination enshrined in World Trade Organization rules, and had also damaged China’s interests. “China’s suspension of some of its obligations to the United States is its legitimate right as a member of the World Trade Organization,” it said, adding that differences between the world’s two largest economies should be resolved through dialogue and negotiation. Tags: China, China Tariffs, Donald Trump, trade war, United States. The population must be pleased to pay extra charges! 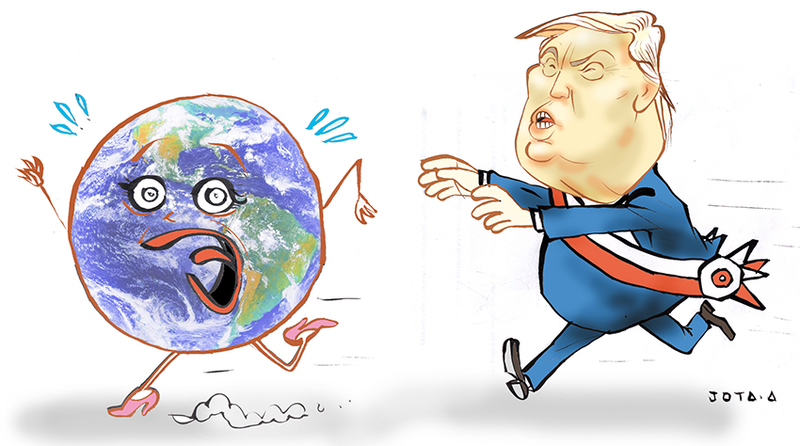 TRUMP WILL SAVE THE WORLD!